If you are a true Community fan then this needs no explanation, but if you don’t know this is a mug that was inspired by the TV series paintball episodes. Find the traditional and classic Greendale Community College crest on a black mug, then pour your favorite hot beverage into the mug and you will see paintball splatter marks appear in a variety of colors. Made from ceramic to be durable and look amazing this Community heat sensitive paintball mug will hold 16 ounces of liquid and will definitely be a favorite go to mug. Support the awesome Greendale Community College with the Community Paintball Heat Sensitive Mug. 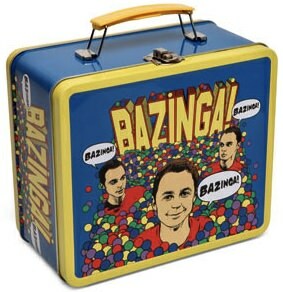 Dr. Sheldon Cooper loves to be on this lunch box so that you can enjoy your lunch with a great The Big Bang Theory lunch box that has Sheldon on it and of course Bazinga. Besides that there are lots and lots of balls on it. So if you like The Big Bang Theory then you just can be without this lunch box. Go enjoy your lunch with your own The Big Bang Theory Bazinga! Lunch Box. We all have fond memories by the famous paintball episodes from the TV series Community. And to get a solid reminder of this fun time there is now this t-shirt. 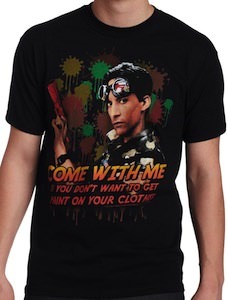 On the shirt you see Abed in front of a paint coverd background while holding his paintball gun and the words under that says “Come with me if you don’t want to get paint on your clothes”. So stop staring and order your Community Abed Paintball T-Shirt. This black Frige t-shirt shows the Frog glyph with the Phi symbol on it’s back and below that the text “FRINGE imagine the impossibilities”. And this amazing looking Fringe t-shirt comes in wide range of sizes from small to 5X. The whole look of this t-shirt makes it special the strange blue white mist surrounding the frong and the text makes it almost like it just fell out of your TV. 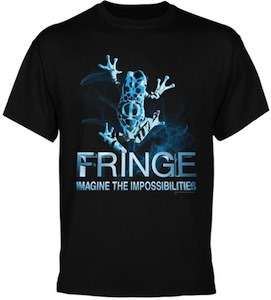 If you are a true Fringe fan then you should check out this Fringe Imaginge The Impossibilities Frog T-Shirt. If you are a big Community fan then this t-shirt will be fun for you. As you can see above the t-shirt shows the Greendale Community College logo and above that the words “A Fistful of Painballs” it looks a bit boring but still a nice Community t-shirt. And it is based on episode 23 of season 2 witch was called “A Fistful of Paintballs”. But when this t-shirt gets exposed to sunlight something happens, colorful paint splaches will show up just like you are shot by a paintball. You have to admit that this sounds really neat. 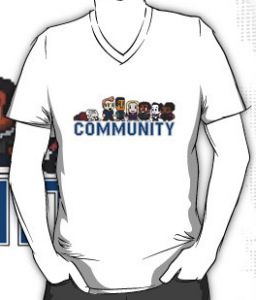 And this Community t-shirt comes in sizes Small to 2XL. 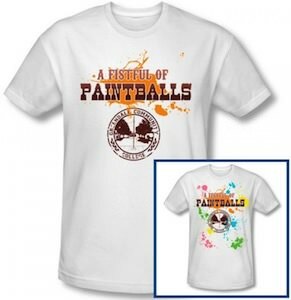 So get ready for imaginary paintball by wearing this Community Fistful Of Paintballs T-Shirt. Do you love the TV show Community, you know the one with all the classic characters that go to Greendale Community College. This is a t-shirt that features the 7 main characters that are all part of the study group, find Pierce, Jeff, Abed, Britta, Troy, Annie and Shirely all in a row and are as 8 bits characters. A very comf and durable t-shirt that is made from 100% cotton and is available in a huge variety of sizes and colors, also check out the different styles of shirts like organic, womens fit, hoodies and more you can get this Community 8 bits characters print on. Take a closer look at the Community 8 Bits Character T-Shirt. The new and refreshing show The Big Bang Theory is a smart and funny television series, this also describes this awsome Big Bang Theory water bottle. A cool way to keep you refreshed and show off your favorite television series, while being smart for the environment. Find your Big Bang Theory Water Bottle. A real Chuck watcher knows about the Tron movie poster in Chucks bedroom and if you are a real fan you even knows what is on the back of the poster. And we all know that Chuck of course only gets like 11 dollars an hour working at the Buy More and secretly being a spy. Then we know all about Chucks handler Sarah and their relationship. So now we got that all coverd we can talk about this case for the iPhone and iPod touch. An all this makes it of course the best Chuck merchandise out there. So you see Chuck is ready to start protecting you iPhone and iPod now it’s just up to you to order this amazing case. 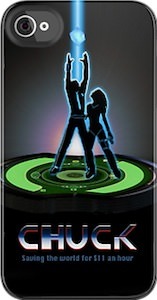 Don’t hesitate come and order your Chuck VS Tron iPhone Case.